Man oh man, I must have eaten a LOT of bread because I was not hungry all afternoon! Not even the slightest!! Here is most of our group! When you live and breathe bread, it starts to show up everywhere… top of the walls even! 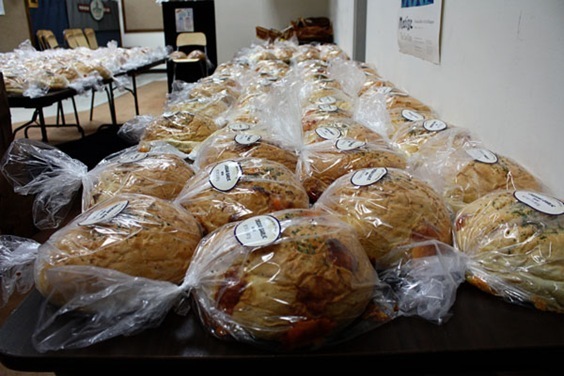 All of this bread was made today for a big sale out of the HQ office tomorrow. The Dillon Great Harvest is only open on special days – like when a training group wraps up and needs practice running a store – so there’s a line down the street of locals who want bread! Tomorrow’s all of the proceeds from the bread are going to be donated to the local high school’s symphonic band. Matt and I actually went to the YMCA here in Dillon after work. The office gave us a handful of free passes. The Y is small, but nice and the staff was very nice to allow us to use the facility. I did a combo of the elliptical and a round of weight lifting that wore me out. Then we walked back to our motel – about a mile. The 40* temps are so pleasant!!! The ingredients. All easily cut or opened with a butter knife. Baby spinach from a box dressed only in salt and pepper plus half a piece of smoked salmon, trail mix, chopped green pepper and carrot and half an orange. I don’t think I’d recommend this smoked salmon. I thought it would be a fun change from the usual pink kind I love, but this was pretty tough and not my favorite. The goat cheese, however, was amazing! We’ve got to get showered and packed – tomorrow’s going to be a busy one. I’m not sure what time I’ll be able to post, but I hope to at least pop in for a hello by lunchtime! We’re checking out of the hotel and having breakfast when we get there at 7AM. 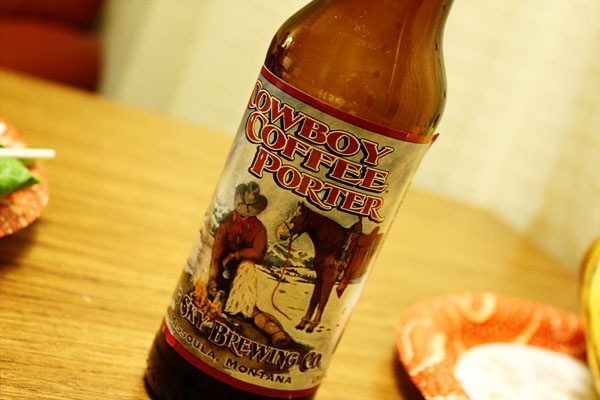 Tomorrow night Matt and I are heading up to Twin Bridges and then on to Bozeman on Saturday for a little outdoor activity! Anndddd…tomorrow is MATT’S 28th BIRTHDAY! Ooo a birthday! Happy early bday Matt! I love the quick and easy hotel dinner! Have a blasty tomm celebrating Matt’s birthday! Happiest of (almost) birthdays, Matt!! And I’m going to have to remember the salad-in-a-hotel-or-motel idea! Happy Birthday, Matt!! Well, one more hour at least. Still dreaming of the pumpkin goat cheese from your bday party. Happy early birthday to Matt!!! I have been obsessed with goat cheese recently. I love it on salads! Happy Early Birthday to Matt! And a happy early birthday to Matt! How FUN! And that salad looks great! Good job on planning your meal, I’m impressed. OOoo happy early birthday to Matt! 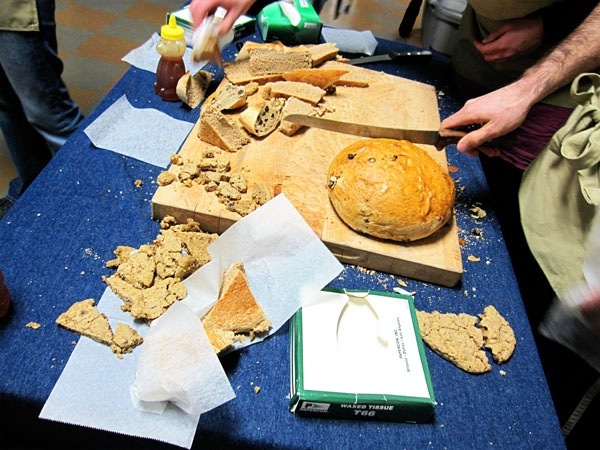 I don’t know if you’ve done one before…but I would love to see you write about the nutrition side of the GH bread. I’ve become absolutely fascinated with the bread following you on your journey and I LOVE bread but am so scared of it b/c like many Americans, I’ve come to fear carbs. The only carbs allowed in my house are multi-grain/whole wheat but after looking at the GH menu in my local town my mouth started salivating over the sourdough they make once a week. Is the GH sourdough “better” or “different” from say, the sourdough you’d get in a chain supermarket bakery? I can’t speak for ALL GH locations since they are all locally owned, but most make plenty of 100% whole wheat breads and sweats with a few white flour products thrown in for fun. The GH design is that the flour is freshly ground on a stone mill each day and the bread goes from wheatberries to flour to bread all using real food. Honey Whole Wheat is the most famous bread and it has 5 ingredients: wheat, honey, water, salt, yeast. With the wheat being so fresh along with a hearty dose of protein and fiber and tons of vitamins, minerals and phytonutrients, it is probably the most nutritious loaf of bread in your city! Sourdough is traditionally made from refined flours, so I’d ask your local owners more about their breads and ingredients to get the scoop. Do not be afraid of bread or carbs – you need carbs to live and be energized. And this bread is one of the best ways you can get them. Ohh I bet those high school students looooooved you guys! That’s really neat that all the proceeds are going to go to their symphonic band, I bet they’re really needing it with all the cuts made in the schools these days. It’s so sad! Anywho, Happy Birthday to Matt tomorrow. Wow, 28 and his own business… y’all are quite the power-couple! Goat cheese makes any meal better! You are so creative with your salads. 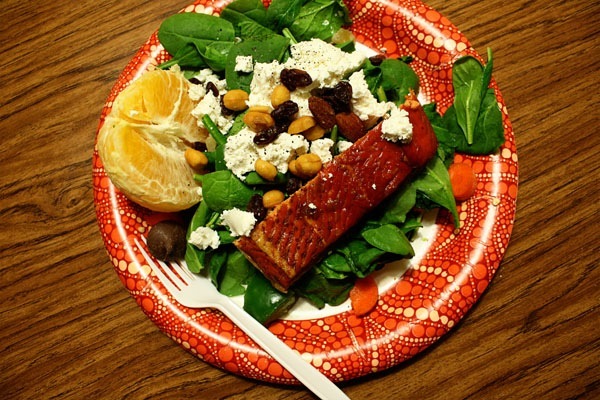 I would never think to put trail mix on my salad, but now that I saw yours, it looks pretty good. Happy early Birthday to Matt. Thanks for letting us all in on your journey to opening up your bakery. I am so excited for you both and know you will make your bakery a success. The bread looks heavenly. Happy early birthday to Matt!! 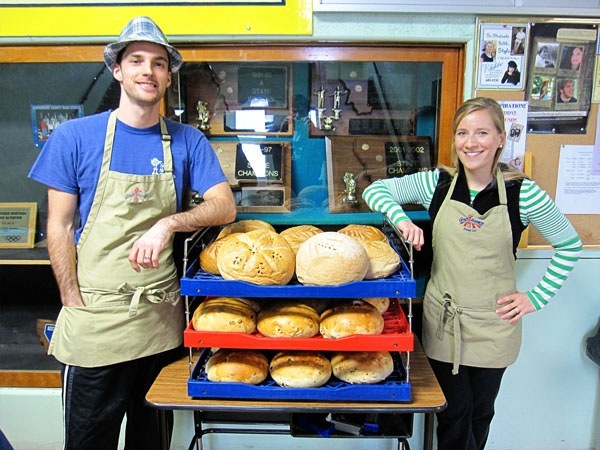 That’s great Great Harvest is dedicating money to the school. 🙂 And for a band no less. 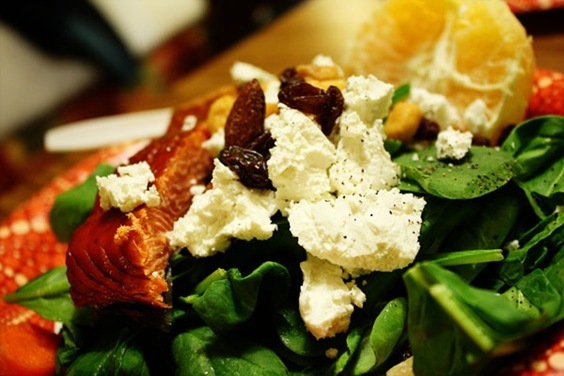 Smoked Salmon + Goat Cheese Salads look delish! Off to check if there are any GH here in Orlando. Goat cheese is always amazing. Happy birthday Matt! Happy Birthday Matt!!! Hope you have a fun day. being stuffed on bread. sounds like heaven!!! happy early bday to matt! Ooh tues was My 28th birthday! happy birthday in advance matt! Happy Bday to you too! Happy almost birthday to Matt! You guys had an extremely busy day and more to come! That’s so great; busy is GOOD! That salad looks awesome considering the limited tools to assemble it. I don’t like smoked salmon, it’s too salty for me. LOVE goat cheese though! LOVE! Dustin is going to be 28 in June. 1983 babies! Great job on another hotel dinner. You make it look better than anything off a dollar menu, that’s for sure. Oh wow! Those salads look wonderful. Just goes to show how easy it can be to throw something quite healthy together in a flash. Yay! 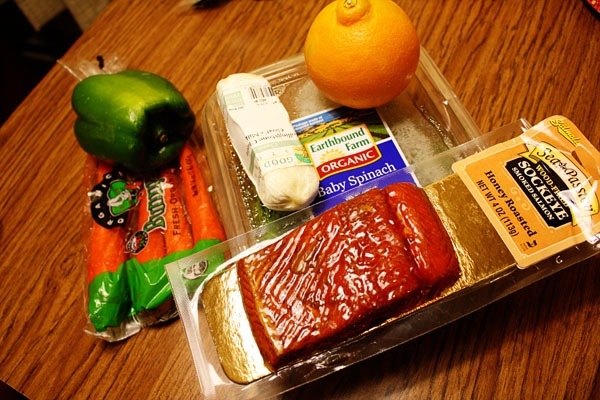 I LOVE that you brought healthy foods into schools! I’m sure that salad tasted so good after all those starches! Looks great – I had a similar salad for dinner myself last night. Are you familiar with yogaglo.com? Happy Birthday to Matt! Today is my birthday too! Looks like you guys had a great day yesterday! What a great thing GH does by donating the proceeds to the band! I am loving them more and more with each post! Thanks Kath! Have fun with Matt tonight! Gosh that seems like a dream, being surrounded by all of that Great Harvest bread!! So jealous!! Looks like you guys are having a blast!! Happy Birthday to Matt! Some do do mail orders, but I’m not sure which ones. Best to call your closest store! 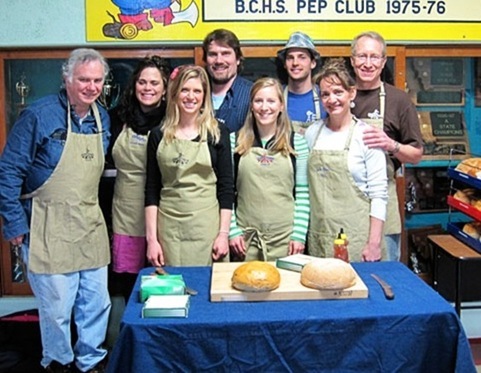 Serving fresh bread to high schoolers? They must love you! We had bagel sales by different school clubs each morning in my high school, and while they were hot and it was a mob scene to buy them… lord knows where they came from! It looks like you are in bread heaven! I really need to get over to Great Harvest and get some of my own. Too good to pass up! I’m impressed by the dinner you created in your hotel! Happy Birthday Matt!! Wow look at all that bread, yum. Happy Birthday Matt. Happy Birthday to Matt!! Sounds like you guys are having a wonderful time! Does GH have any gluten free breads…? Do you just ask for free passes? I get so nervous doing stuff like that but I would love to take advantage of free trials and such when I go away. Any tips? 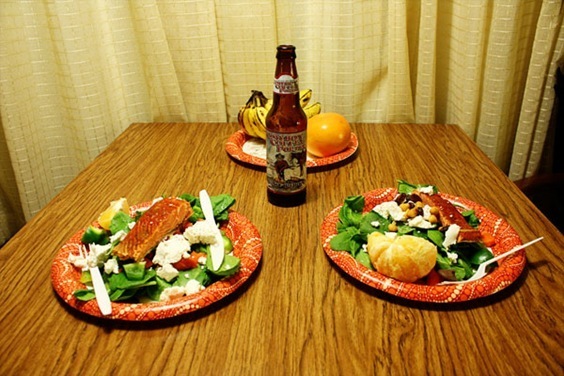 Your hotel meals are better and more inventive than many peoples home meals! again, GH sounds like an amazing company! i think that photo should be your 2011 christmas card shot–so cute! I like your salad! 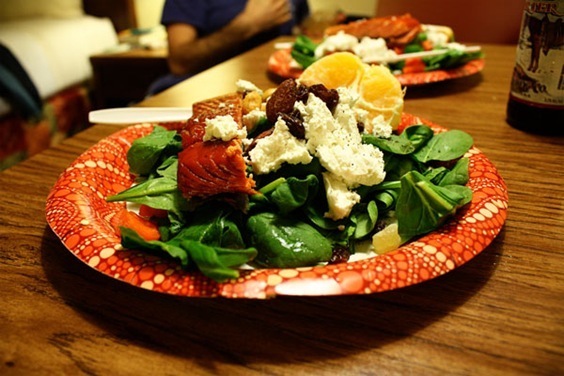 Next time squeeze the orange and use it as a dressing for the salad, I love spinach salad with goat cheese and orange vinaigrette, it is delicious!! Usually I’m alright with being gluten-free. With these latest posts…not so. 🙂 Looks delicious!! That’s a fancy dinner for a motel room! I would have loved a fresh slice of bread after school let out, what a great idea! And very impressed with your hotel dinners. I hope that I do that when I travel too! Happy birthday Matt! I guess you’ve got an exciting year ahead. Happy Birthday to Matt! You’ve got every reason in the world to celebrate! I love reading about your hotel room meals. They’re so creative! Didn’t you once say that you weren’t a fan of sockeye? Maybe that’s part of why this one didn’t suit your fancy so much. I would kill to be in a room with that much bread (GF though).. i love the stuff. 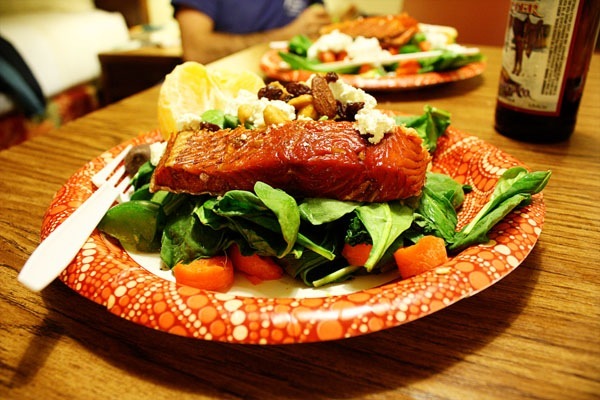 that salmon salad looks soooo good!!! Hi kath! So glad you are having a great time! Super random question…did you finish reading the Girl with the Dragon Tattoo book? Just wondering what your thoughts about it were…I’m debating whether or not I should start it! could work training ever be more fun? i think not! I have a hot 28 year old Matthew in my life too 😉 Haha. OMG, I want to eat all that bread!! Kath, I truly cannot believe how much you can do in a hotel room — it’s incredible! This looks gourmet. Ahhh, wonderful. And I’m certainly jealous of all the GH bread! super smart hotel salad. if only I could get the boy to eat smoked salmon.